Markham's Behavioral Health: Pediatricians should talk with parents about guns and their children. 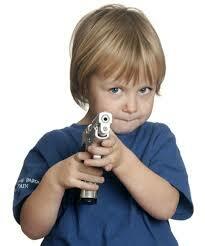 Pediatricians should talk with parents about guns and their children. "Almost 5 million children live in homes where at least one firearm is stored loaded and unlocked," Kavita Parikh, M.D., a pediatric hospitalist at Children's National Health System, and co-authors write in an invited commentary. "This study is a loud and compelling call to action for all pediatricians to start open discussions around firearm ownership with all families and share data on the significant risks associated with unsafe storage. It is an even louder call to firearm manufacturers to step up and innovate, test and design smart handguns, inoperable by young children, to prevent unintentional injury," Dr. Parikh and colleagues continue. The Children's commentators point to the "extremely dangerous" combination of "the small curious hands of a young child" and "the easily accessible and operable, loaded handgun" and suggest that pediatricians who counsel families about safely storing weapons tailor messaging to the weapon type and the family's reason for owning a firearm. 1.7 million children live with unlocked, loaded guns - 1 out of 3 homes with kids have guns.